How to get a building permit – First off, I plan to build a deck. I live in Kosciusko County, Indiana. The building code here states that I must have a permit if building a deck that is more than 12″ off the ground. My yard slopes down (as it should) away from the house for drainage, and the door is 24″ off the ground as well. My deck will be 24″ inches high at the door, and over 3′ at the furthest point from the house. No problem, I think, as I’ve done my research on what I need for the deck’s building permit. I have a plan drawn out with measurements detailing them. 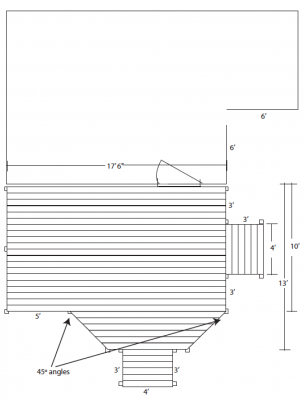 Here is a copy of the plan: Building Permit Deck Drawing. My next step in getting a building permit was to visit the local building inspector in my town. He is only in office two days a week, so I have to wait through a prime weekend, off work. The next week, when I made it in to his office, I was told that since my property meets up with a road on three sides, I have to maintain a distance of 25′ from the road right-of-way on all three of those sides. The only problem with that is my house… It is inside of the 25′ right of way. In order to get a building permit, I now get to go to the county courthouse and request a variance. “How to get a building permit” just became “How to get a variance to get a building permit”. The first step in getting a variance is paperwork, of course, and a $75.00 fee because filing paperwork is expensive. I submitted a plan for the deck, detailing how far from the property lines, and road right-of-way it will be. I had little doubt that I’d be approved because the deck is to be further from the road at its closest point than my house is. This is all well and good, except the board that reviews applications for variance to building permits only meets once a quarter! We didn’t know about this fact, but very luckily, we submitted our application on the last day before we’d have to wait three months for another chance! The next step in getting a variance for a building permit, in this case is to hand out a flier to each of my neighbors who own property adjacent to mine, and to get their signature stating they received it. The paper gives the time and date for the variance hearing. Because my house is close to a road on once side, and that road is a “one lane right of way”, the variance must be obtained. If there is an emergency, someone may have to drive through my yard, say, if the road was blocked by oncoming traffic. This hearing will give my neighbors the chance to voice any opinion about the possibility of impeded traffic due to my deck. All of my neighbors thought is was a silly notion, that I even had to go through this process. I agree. It was very difficult to get a hold of a few of the neighbors, so their copy had to be sent via certified mail. The day of the hearing came, and none of my neighbors showed up. I explained about the deck being further from the road right-of-way than the house. The Kosciusko board heard my explanation and agreed there would be no problem with the deck and approved my variance! I now had county approval and a building permit from them. My city also required a building permit, another $15.00 fee, and it was settled. They saw the variance approved by the county and I’m ready to build my deck. This may not be how to get a building permit in every circumstance. It depends on what you’re building and where you live. I recommend checking with your town hall first, and if they don’t know, call the county.